A priceless classic at an affordable price! Based on the NKJV, Reimann's modern language edition of Chambers's best-selling daily devotional features heart-challenging, life-changing insights on everything from adversity and assurance to worry and worship. 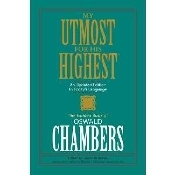 An "utmost" gift-giving opportunity for everybody you know---and for yourself! Includes Scripture and subject indexes. 400 pages, softcover from Barbour.